With last night’s loss, the Nationals fell a game below .500 as they watched manager Dave Martinez get ejected for the first time this season. With Chip Hale given the keys to the kingdom he made several moves that worked like inserting Matt Adams as a pinch-hitter and he promptly rewarded Hale with a home run. Hale removed Stephen Strasburg from the game before he fatigued himself, and he replaced Brian Dozier with Howie Kendrick. Whatever is going on with Brian Dozier is not good. Whatever is going on with Ryan Zimmerman though has been analytically there along with the eye test for a long time. To have two almost automatic outs in the #2 and #5 spot in your lineup is a rally killer. In the first inning despite Dozier striking out in a 3-2 count, Dereck Rodriguez seemed to pitch around and walk both Anthony Rendon and Juan Soto to get to Zimmerman who he struck out on 4 pitches. Later Zim struck out on 3 pitches on his way to an 0-4 night and a .188 batting average. If it was not for Zimmerman’s .571 batting average against lefties this season he would be batting .119 as he is only 5-42 this season against right-handed pitchers. The interesting part is there are some righties that Zim does hit well, but this has been a trend for years now — but the Nats braintrust says they are into “analytics” and will play the “best nine”. We heard that all off-season. When Matt Adams did not start against Rodriguez yesterday, it was somewhat surprising considering Adams was 1-2 against him with 2 RBIs. In Spring Training, we voiced our concerns over Dozier and Zimmerman in particular. The comments were interesting as they usually are. Camp in West Palm Beach was very positive so when you write something critical, it throws some shade on all the positivity. What are Rizzo and Martinez doing? You spent the money and you are playing perhaps your best 5 on some nights because Wilmer Difo also cannot play every day. It is time to call-up Carter Kieboom to play either shortstop or 2nd base and play Matt Adams at 1st base against most right-handed batters and get Howie Kendrick some games at 2nd base. It’s kind of bad when you question the manager on April 16th about Brian Dozier after it was apparent in Spring Training that, um, we have a problem. Maybe, just maybe the reported bone bruise is not what his issue was when he batted .188 with the Dodgers last year. He is doing worse now with the Nats. Who on Rizzo’s staff did the due diligence to look at bat speed? Who is accountable for all the bad signings? Rizzo had $60 million to spend in the off-season and he committed with incentives potentially $24 million of it between Dozier and Trevor Rosenthal. The biggest chunk went to the highest paid pitcher in free agency, Patrick Corbin, who was the consensus #1 and not much of a stretch except for the money spent which the Nats reportedly outbid both the Yankees and Phillies. Yes, Corbin did not look great in Spring Training but he was “working” on his “stuff” but when it comes down to it, Rizzo’s reclamation projects in Rosenthal and Dozier are losing games for this team. The money is spent. Put the best 9 out there like you promised the fans Mike. This team should start today with the best nine because you cannot win a pennant in April but you can sure lose it. A repeat of last year’s 11-16 April record almost sunk the team that had to push the pedal to the metal in May to get back to 1st place only to never see 1st place again after June 9th when the starting pitching was stressed so far in May that they fell apart literally if you consider that Strasburg ended up on the DL in early June of 2018. There is time to turn this around. Trea Turner will be back soon from the injury list, but will this team be close enough to 1st place to make a run for it? Personally speaking I do not play the hindsight card. Sure, I quote the stats which are always accumulated in hindsight, but anyone with a scout’s eye could see the writing on the wall in Spring Training. I gave my suggestions on who the Nats should have signed and said with Carter Kieboom in the wings you sign Derek Dietrich. I pointed to the stats on November 21st while also making a case that the Nats get Patrick Corbin. 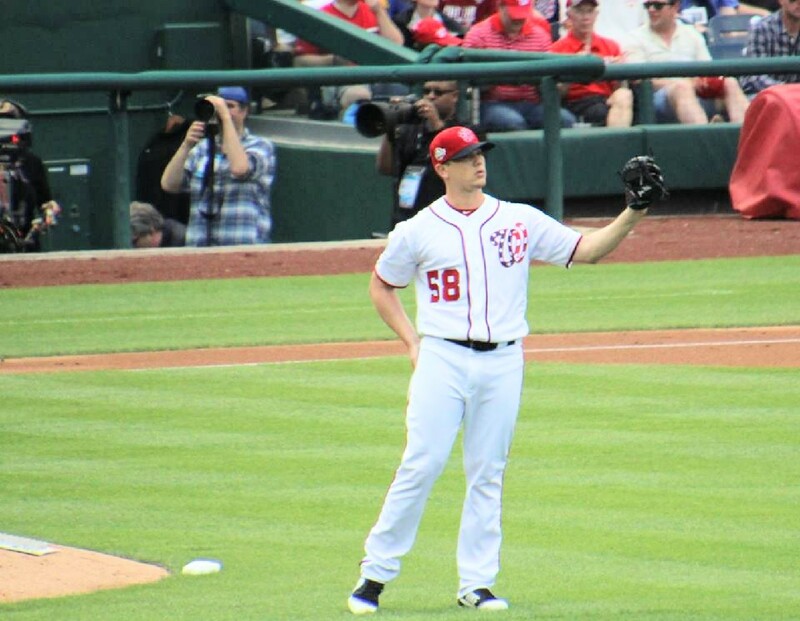 My team for 2019 would have been Wilson Ramos catching, Matt Adams 1st base, Derek Dietrich 2nd base, Trea Turner shortstop, Anthony Rendon 3rd base, Adam Eaton RF, Victor Robles CF, Juan Soto LF and the only change in my starting rotation was Wade Miley instead of Anibal Sanchez. What I did was make moves that also saved a lot of cash. I also would have extended Zimmerman to bring down his AAV for this year and I would worry about next year – next year. By getting Ramos with Suzuki, I would not have traded away Jefry Rodriguez who would have been my long-man in my bullpen and starting pitching depth. Am I happy with the Gomes acquisition? Sure, Mike Rizzo went a different route, but what he did was spend a lot more money and did not leave himself in a position to acquire Craig Kimbrel. So where are we now? Rizzo spent his $60 million like it was burning a hole in his pocket. He went over the CBT cap in 2017 for no reason, and poor planning. Last year, he had the opportunity to get under the cap by trading players, and he ended up over the cap again. Being a general manager is not an easy job. You do not work in a vacuum. Some players are not available at the time you want them. But this off-season was a fail. Outbidding teams for players is not exactly a great way to approach free agency. Sure, the Nats got Patrick Corbin that way, but if that is the plan long-term you end up with no money left. Rant over, today’s matchup is Jeremy Hellickson and Jeff Samardzija.